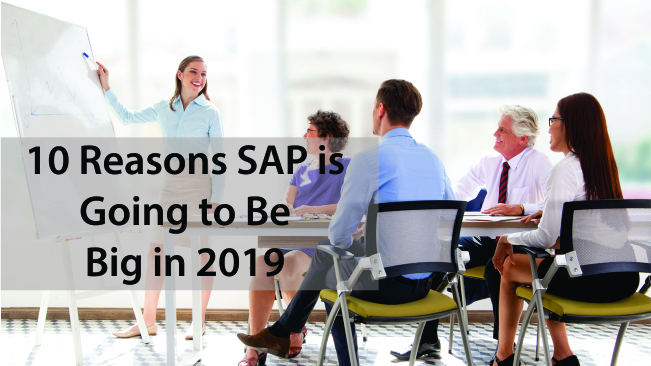 2018 was a memorable year for the SAP world. ERP (and hence SAP) began figuring prominently in conversations about digital, S/4HANA established its claim as the next-generation digital core, Leonardo developed further especially in Artificial Intelligence and Machine Learning, and the launch of C/4HANA signaled SAP’s aim to take on the CRM market head-on. The SAP market experienced buoyancy probably not seen for more than a decade. Perfect for all types of Business: SAP works with almost all kinds of industries, but the other ERP systems cannot work with every kind of business. Most of the organizations that are applying a new ERP likely not know the exact modules or functions they need. SAP contains an extensive collection of a custom fit without paying for customization. Shorter Implementation Time and Fastest Financial Payback: SAP is the second most costly ERP system after Oracle. As compared with other ERP system, it provides the most rapid financial reimbursement which is an advantage for businesses utilizing SAP. Together, in SAP the implementation time is shorter than its equivalent which also allows faster success. SAP Needs Fewer Customizations: SAP has different innovative functionalities compared with other ERP system. Thus, it needs minimum customization which can reduce down the implementation time. Though, it is observed that SAP provides various customizable solutions which will be suitable for almost every type of business needs. Industry Best Practices: SAP ERP is executed according to the industry best methods and case studies; this confirms that companies stay equivalent to the opposing companies in the industry. The utilization of industry best practices for reference affirms that there is a reduction in cost, risk as well as in time. Cost reduction is achieved due to the rise in the utilization of resources. Presence of Clearly Defined Roadmaps: The SAP ERP implementation includes roadmaps which are specifically defined. These roadmaps serve as a reference point at the time of SAP ERP implementation. The roadmap is segregated into different phases like the business planning phase, the project preparation phase, the concluding preparation phase, the understanding phase, and the go-live and support phase. Each of these stages is further divided into more complete step by step guide. Industry Specific: Different industries have their particular SAP ERP solution. The solution is devised in such a way that it meets the needs of the industry. For instance, ERP material management module is fit for motor vehicle manufacturing industry but it is not fit for an accounting industry. The various modules are adjusted to capture all the primary business procedures in different sectors. Scalability of Software Solutions: Scalability feature is a necessity in software solutions to achieve success. SAP is the abbreviation for Systems, Applications, and Products in data processing. SAP ERP solutions are essentially designed to improve with the business, which means that as the organization size rises their capacity also rises. Well, this is a crucial feature which inhibits the software solution from being static since the organization practices both internal and external modifications. In this post, we have learned the reasons for the growing popularity of SAP and we can conclude that SAP is the most demanding ERP system these days as it has numerous benefits over other ERP systems. SAP ERP software helps the organization to integrate and simplify its different business processes like HR, finances, manufacturing, and other operations. SAP is a global solution and fit for all type of businesses.